On your home page, link to your profiles and add the rel="me" attribute to the links. Note: If you don't want visible links on your home page, you can instead use <link> tags in your html head. You can also sign in with a PGP key if you don't wish to use a third party service. You'll need to verify that each service has a link back to your home page. 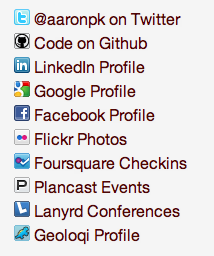 For convenience the "edit profile" links for some supported services are below. For links such as Email and PGP keys, there is obviously no way to "link back" from those, so you will be presented with a challenge when you sign in. That's it! You're done! Now you can use your domain to sign in to any sites that use IndieAuth.com!